IVP turns 25 years old this Friday, and like with any pizza, it was the ingredients that made the 1992 pizzeria such a success. Being a Macon Native, Tina saw a need for an independent pizza restaurant and decided to take on the challenge of opening her own business. For a restaurant business, especially one that predates downtown Macon’s current food and beverage boom, 25 years is no small achievement. Anyone who has operated a restaurant for 25 years must be doing something right. The back story on Tina Dickson’s rise to restaurateur fame is a very interesting tale indeed. Running the best pizza joint in town was not something she just lucked into on a whim. When it comes to food, a lot has changed since the 1990s, but one thing has remained constant: Ingleside Village Pizza. Let’s take a look back at how it all began. 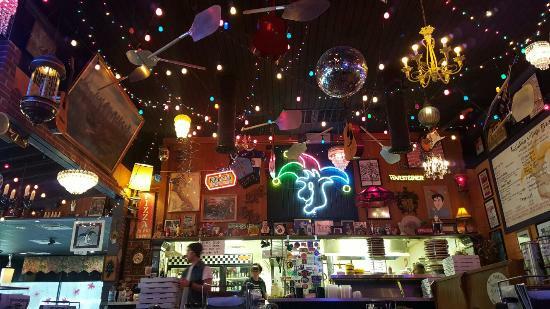 In the early planning stages of kicking around ideas, Dickson wanted a restaurant that was a great place to sit down and eat while having a beer and visiting with others. She had an idea of what they wanted in their own establishment and what would work; a casual, warm restaurant with counter service over table service and great beer that people would love. From day one, IVP was selling 35 imported beers and 18 domestics — an anomaly for Macon in the 90s. Ingleside Village Pizza’s humble beginnings started at its original location on 2396 Ingleside Avenue in the corner building that once was home to Fickling & Walker Real Estate Office. Let's take a look back 25 years ago to where it all began. Starting with just 10 pounds of dough and a little patience, Tina worked on Ingleside’s first pizza recipe. The goal was simple; make fresh, hand-tossed and delicious pizza. After months of blood sweat and tears, Ingleside Village Pizza opened on July 28, 1992. People were lined up out the door waiting to try Macon's newest pizzeria. Two boys on their bikes circled the parking lot, waiting to be the first customers. When the clock struck noon, IVP served a packed house and its been that way ever since. In the spring of 1995, Dickson bought out co-owner Saralyn Collins, who went on to start her own very successful catering business Good to Go and now owns Grow a farm to table restaurant. Business for Dickson continued to grow, as did her family, when she and her husband Trevor welcomed their daughter Eliza that year. After 17 years on one corner of Ingleside Avenue, Dickson decided to purchase the building across the street that was formerly known as Pick up Meals Express and moved her pizzeria there in 2009 transporting behind years of memories, but leaving behind the landmark mural at the intersection of Ingleside and Corbin avenues in Macon that was later painted over yellow. Owning and operating a restaurant is something many people try, but few succeed. It is a hard job filled with working nights, weekends and holidays. Making sure customers are satisfied, employees are happy, bills are paid and making a profit are all parts of the job. Somehow Tina has found a way to succeed in a business that burns out most in just a few years. Not only has Tina thrived, but she has done so with many fond memories along the way. Affectionately known as “Our Lady of Pizza”, Tina Dickson is more than just the owner of Ingleside Village Pizza, she’s family to her customers. Speaking with Tina is like talking to a family friend, it’s conversational and engaging. You feel like you’ve known her for years, even if you’ve just met her. Tina has always been very open and passionate about what she does and she knows customers by first name and her employees are more like family than her staff. Whenever you enter Ingleside Village Pizza and walk up to the counter, Tina always makes everyone feel as if you were the most important person she has seen that day. Congratulations to Tina and Her Staff for 25 Great Years! Here is to 25 more!